Think about where you work at the moment. Or the project you’re working on right now. Imagine if you could access ‘something’ to get all the different kinds of content, sliced and diced, using any possible dimension (user, context, device, location, language, profile, etc.) that makes sense to the business. One simple, standard, repeatable, predictable, reliable and scalable way to get your hands on that kind of information. What value would you place on that? The value of Content APIs equates to what value do you place on that above. To be able to communicate and grant access to the controlled consumption of content internally and externally within an organisation. Who wouldn’t want that. 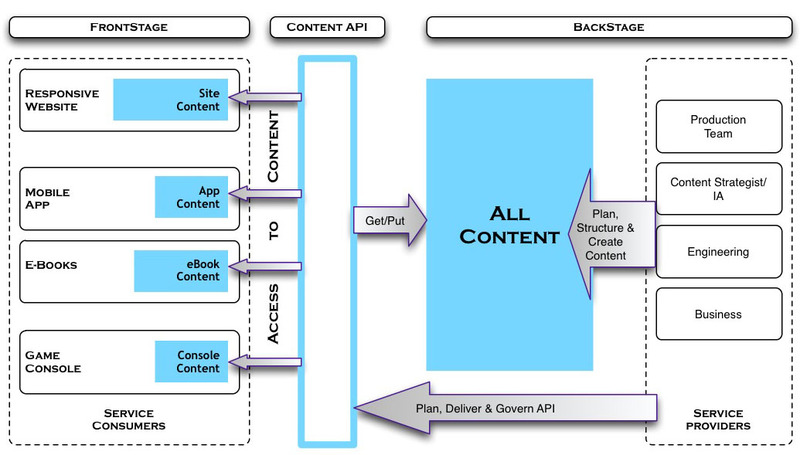 APIs are a programmatic doorway to content. Everything behind the door (backstage) is a direct result of the hard work invested by the “service providers” to make content accessible. That frees the frontstage “service consumers” to focus on putting the content to best use. To deliver a responsive web site, or serve an mobile application, or power media consoles, or even your fridge tomorrow. A Content API provides a clear separation of concerns between those backstage defining, understanding, structuring and developing content from those front of stage that want to access the content and go do something amazing with it. Both service providers and consumers can thrive independently of one another, with boundless opportunities for innovation on either side of the API. However, when done right we can quickly move beyond simply separating content from presentation to truly getting content everywhere it needs to be. And those of the benefits that the big guns are already enjoying today. There is nothing stopping you from doing the same tomorrow. Any API must be easier to use, manage and scale than the existing backend systems at work today. APIs are primarily for scale and accessibility. The Netflix API grew x37 in the first 13 months and now boasts 33% of the US evening internet traffic. Back in 2011, Google, Twitter, Facebook, Netflix, Bing, and eBay big guns appeared in the API Billionaires Club. Entry into the club requires at least 1 billion API transactions per day. The real business opportunities start to present themselves once a maturing API becomes a core capability within the business. This means start small, think big. APIs don’t require massive teams to build. Small, flexible and nimble development teams can create big returns on investment. APIs require vision, clear leadership and a story that resonates with stakeholders. The true value of APIs comes from internal consumption use case, and how to make content accessible within your organisation, rather than the public open APIs common scenario to attract others from outside. Content APIs are the programmatic vernacular for your content. APIs are going to get a lot more popular, very quickly. But APIs need a solid foundation. It’s a programmatic interface to your content. So where does the vocabulary for the tasks and content that the API provides access to come from? How do developers know what to design and build? What are the dimensions we need to slice and dice the content? What content and asset types should the API provide access to? Who is permissioned to access what? Great APIs are founded upon solid models. So if you’re building a Content API, be sure to create a content model FIRST that conveys the required level of structure and meaning. Exciting times. Thanks for a great article! How do you think solutions like Contentful and Prismic fits into your models? And/or are there other interesting players on the backstage, middlestage (API) and frontstage arena that we should look into? an exciting and really detailed article! GraphCMS should be just the thing, right?